Our heartfelt message to our dearest customers We believe every person has experienced this situation: A certain thought or idea comes up and you have the urge to jot it down right away or it might be lost forever. This idea might seem little but it has the potential to be great. Keep in mind that many revolutionary innovations started with one simple thought. Jotting it down might be the greatest decision you ever make. A person in this digitized world would note it in one of his fancy devices. But is it the best option? Why do time capsules exist? As ideas are intangible, we believe the best way to preserve them is by making them tangible, in an actual safe. One that you can carry with you at all times. We designed our notepads based on this concept. A portable "safe" for things worth remembering. It is made with the purpose of providing the feeling of safety, convenience and compactness.A pocket notepad that will last as long as it is needed, a faithful reminder of things you cherish. PACKAGE: Padfolio 1ea, 5 x 8 inch legal writing pad 1ea(40 sheets) It is a package with 2 sorts of items. So when you receive a shipping box, check the items. The padfolio has AHZOA brand logo and spelling with classy mood in the back side.Be careful! The padfolio is not fit for A5 legal writing pad. It is useful for 5 x 8 inch legal writing pad or smaller. Our heartfelt message to our dearest customers We believe every person has experienced this situation: A certain thought or idea comes up and you have the urge to jot it down right away or it might be lost forever. This idea might seem little but it has the potential to be great. Keep in mind that many revolutionary innovations started with one simple thought. Jotting it down might be the greatest decision you ever make. A person in this digitized world would note it in one of his fancy devices. But is it the best option? Why do time capsules exist? As ideas are intangible, we believe the best way to preserve them is by making them tangible, in an actual safe. One that you can carry with you at all times. We designed our notepads based on this concept. A portable "safe" for things worth remembering. It is made with the purpose of providing the feeling of safety, convenience and compactness.A notepad that will last as long as it is needed, a faithful reminder of things you cherish. 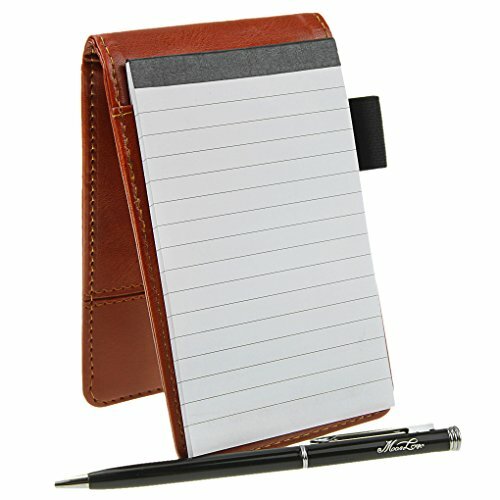 This faux leather pocket notepad with business card pockets and pen holder is designed keeping in mind a professional requirement of taking quick notes while on the go. 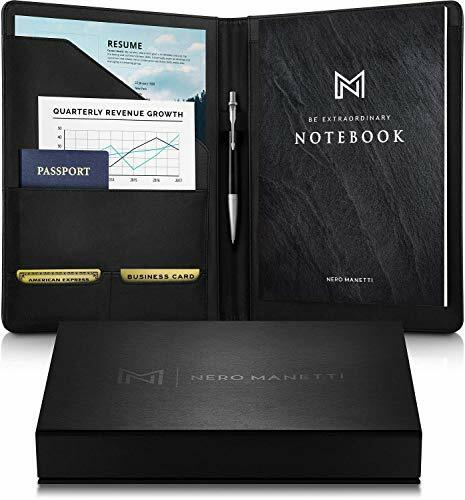 This notepad organizer features a black hardcover design made of faux leather for a sleek look and feel. This pocket notepad organizer includes a mini writing pad of dimensions 2 7/16" x 4 1/4" with 40 lined sheets. 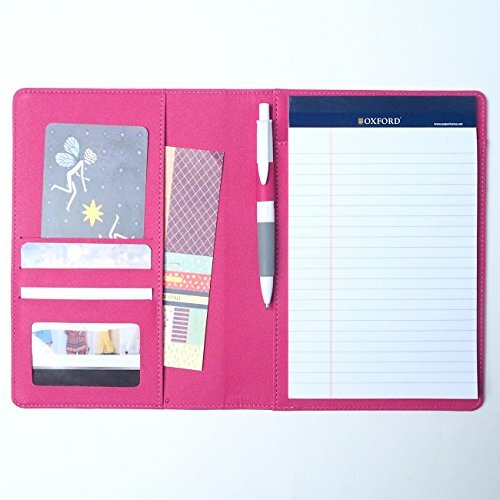 The outer cover of this note jotter can be easily removed and can be refilled with notepads of similar size. 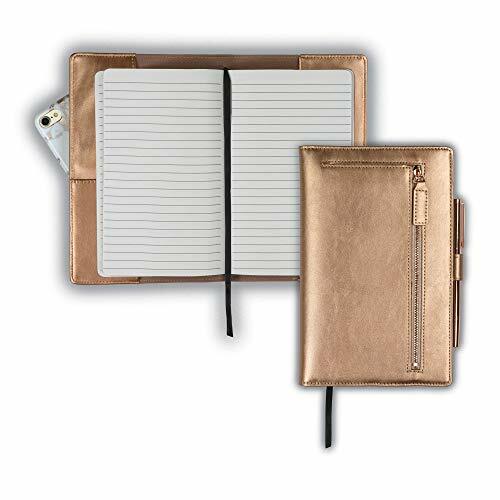 The notebook holder organizer has an ideal size enabling you to carry it in your shirt or pant pocket while still large enough to easily take notes. 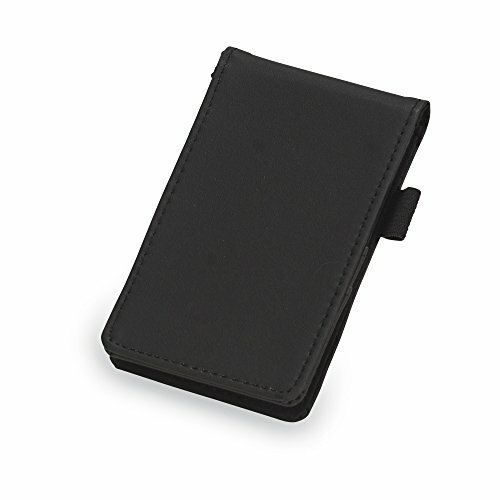 This flip notebook holder also features two business card pockets for keeping important cards easily accessible. 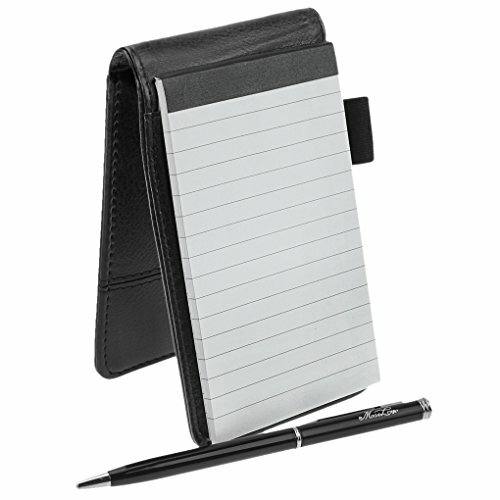 A pen loop is also added on the side of this notepad organizer so that you can have easy access to a pen at all times. There is nothing quite as stylish as a classic & elegant leather journal. 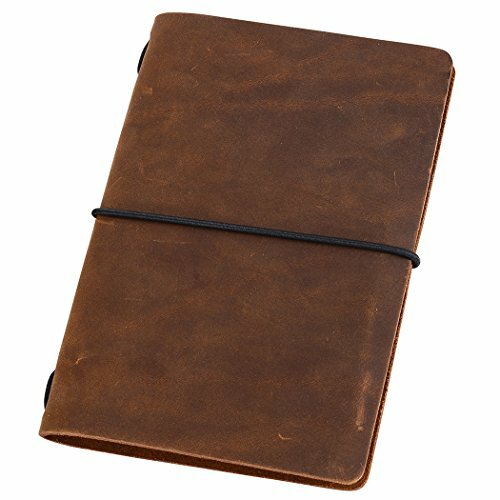 This travelers notebook fit Field Notes memo books, or the pocket size Moleskine Cahiers, or any other notepads that are roughly 3.5 x 5.5 inches. 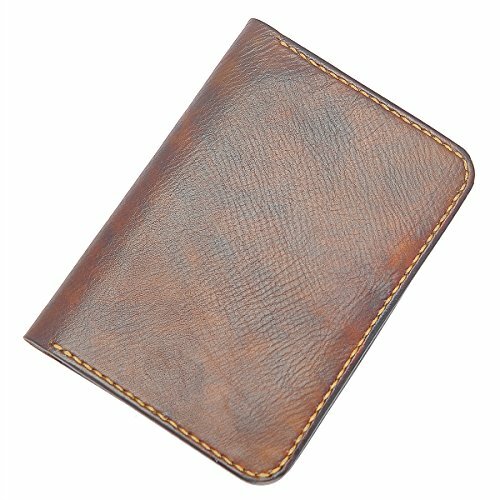 The full grain leather cover is supple while still sturdy enough to provide support & protection for your notebooks, and it will develop a beautiful patina over time. A small 3.5x5.5" notebook is included to get you started, and you can use the spare elastic band (which is attached) to add up to 3 inserts. Order today and protect your ideas! Office desktop caddy organizer, great for keeping your desktop neat and tidy. 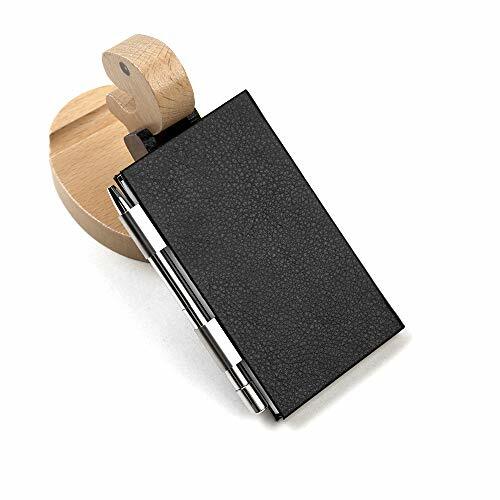 Features 2 file slots for letters pads envelopes.1 pen/pencil holder compartment, and a slanted memo pad platform and a mini slide out drawer for pins, clips, etc.. Made of durable scratch resistant steel wire mesh. Approximate Dimensions in inches; 5.3 L x 5.8 W x 5.12 H.
A PADFOLIO LIKE NONE OTHER. After considering the needs of modern-day professionals, we, at Samsill, are happy to say that we’ve come up with an organizer to make your life at work more comfortable & stylish, all thanks to our well-received Samsill Professional Padfolio. Available in 2 sizes (13” x 10.5” & 10.9” x 9.7”)– pick yours at the top of this page. To put it simply, it’s the only padfolio you’ll ever need. It uses synthetic leather that carries the feel & look of premium Napa Leather to help you make a positive & lasting first impression. Its minimalist design is a perfect fit for all environments – from Fortune 500 boardrooms to university classrooms. SAFETY FIRST! To keep your belongings secure, this resume portfolio uses a wraparound zippered closure. CARRYING YOUR TABLET ALONG? NO PROBLEM! Our business portfolio includes a 10.1-inch built-in padded tablet sleeve that can hold most tablets out there. STAY ORGANIZED. An expandable document pocket helps you store anything & everything from loose pages, letters & envelopes to leaflets, invites & personal IDs. 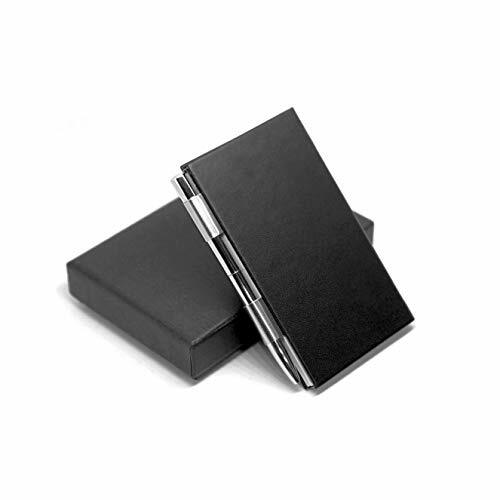 A standalone business card holder can hold all your business cards in one place. WANT TO TAKE SOME QUICK NOTES? We’ve got you covered with a refillable letter-sized writing pad (8.5” x 11”) & a pen loop. For all men & women out there, from students & graduates to top executives, who care about making a solid style statement without giving up on much-needed utility, any old portfolio binder, portfolio case or portfolio case won’t do. If you wish to try out the best padfolio there is, click ‘Add to Cart’ & order Samsill Professional Zipper Padfolio today! Keep your workstation both organized and stylish with this convenient and decorative sticky notepad holder/mail sorter/telephone holder.It breaks through the traditional design of the flat board and remove the trouble to your finger when carry documents. We artfully laser engraved any name next to the apple on this personalized acrylic holder with notepad. Made of high quality clear acrylic. Notepad is included. 100% new product Reinforced construction- stronger hinge, more durable and anti slip rubber feet. Completely redesigned and engineered from the ground up to be stronger, more stable and store flatter. This stool is certified tested to hold up to 300 pounds flat weight. Great step up for in the kitchen, bathroom, RV's, children and more. We guarantee the satisfaction of our products through high quality and service, low prices, and fast, safe shipping. Quick Toss & Replace, Easy Dispensing Waste Bag by Cubit! This is a Mickey Ears Notepad Holder.